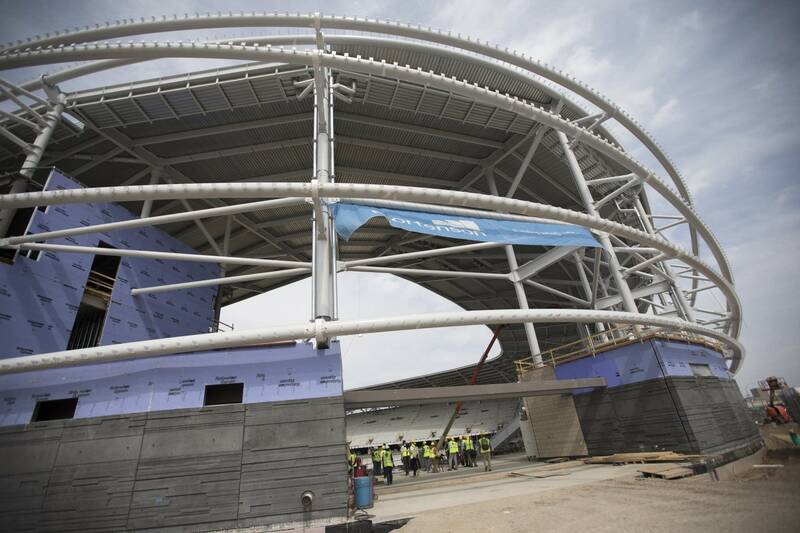 In less than a year, Minnesota United is expected to play its first soccer game at Allianz Field, the team's new stadium in St. Paul. Construction of the 19,400-seat facility in the city's Midway neighborhood has just reached its halfway point. Construction crews worked through the winter and into a really snowy spring. 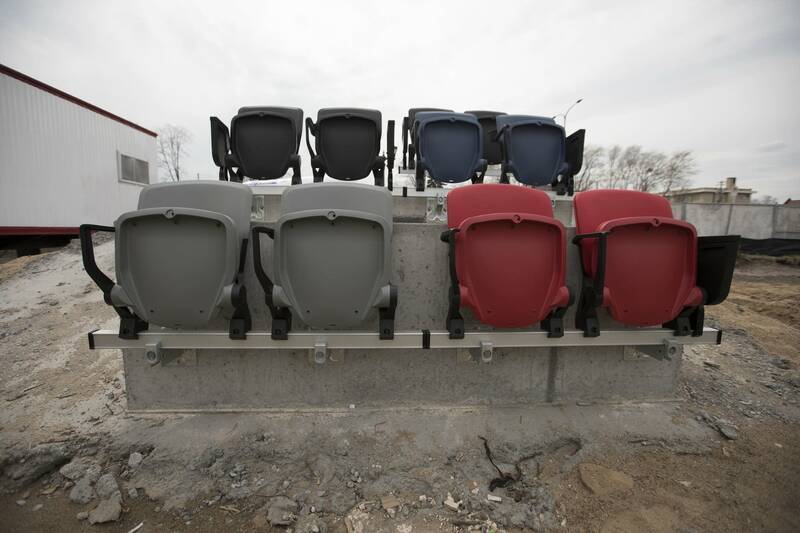 The progress was easily visible as the stadium's exoskeleton grew next to busy Interstate 94 at Snelling Avenue. 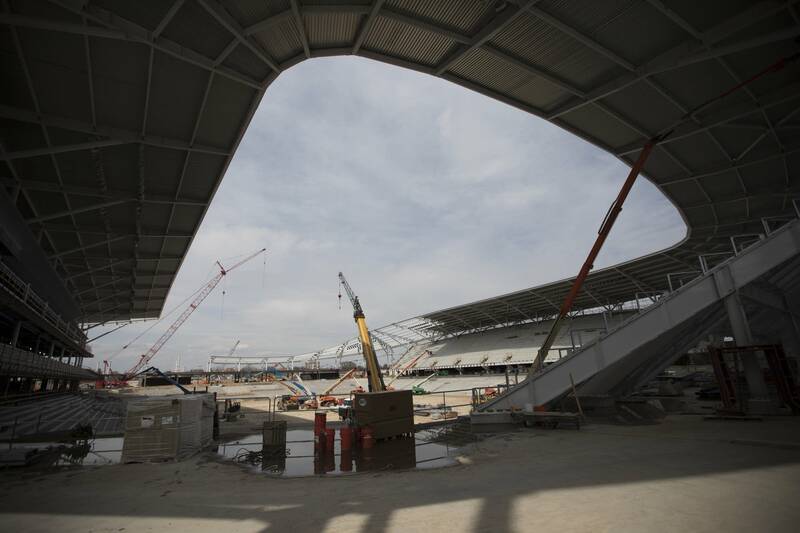 The concrete is set, the big cranes are gone, and much of the stadium's architectural signature — tubular steel — is in place. Project manager Greg Huber of Mortenson Construction said that so far there have been no major surprises, like the 250,000-pound rock that builders of the Metrodome unearthed in 1980. 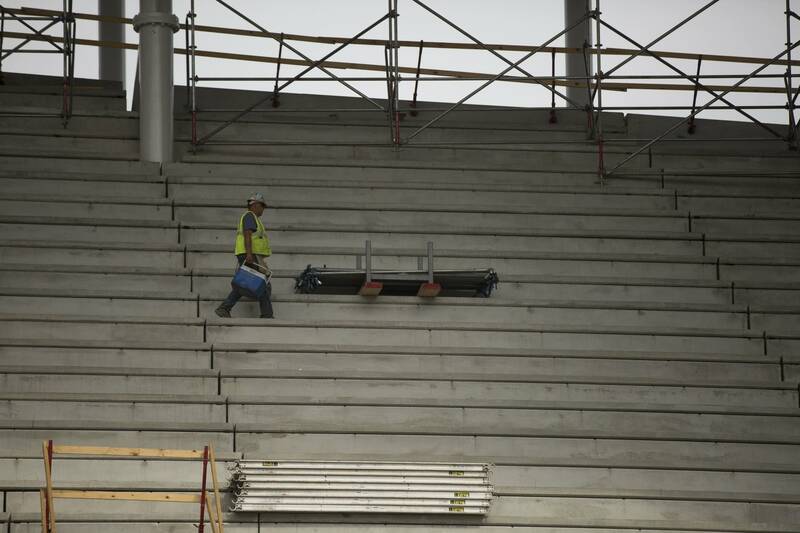 Engineers did geophysical scans of the ground before starting on the soccer stadium. But it turns out it's much easier to predict what a backhoe could run into than what might fall from the sky. "The weather is probably the biggest unforeseen. We had one of the wettest Augusts on record," Huber said. "And then this winter was snowy, it was cold, so our folks were under enclosures for a long time. A lot longer than typical, but that's living in Minnesota." Despite the precipitation and cold conditions, Huber said the $200 million project is on time and on budget. The video boards are set to be delivered in mid-May. 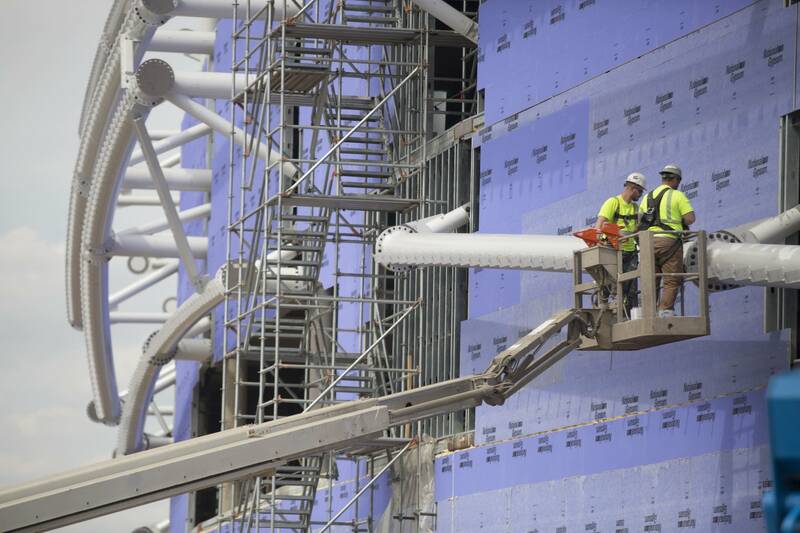 The crew is scheduled to top out the canopy on May 24, and soon after that, workers will begin installing seat brackets underneath. Perhaps the most noticeable change is due in less than two weeks when the first section of the exterior rain screen arrives. Workers will install a 10,000-square-foot piece of translucent plastic, a material Huber said is unique to this project. "It's special because it has glass fiber yarns that have been woven into a mesh, and so the fabric itself is very strong, and then they laminate it in PTFE, which is a Teflon-like material, and that allows a lot of the light to come through without having the wind and the water come through," he siad. The stadium is being funded privately, though the city of St. Paul is kicking in $22 million for road, sewer and other infrastructure improvements around the building. That includes a system that uses stormwater for irrigation. At the stadium's official groundbreaking 17 months ago, the site was nothing more than empty land — the former site of a bus garage — with a strip mall at one end. 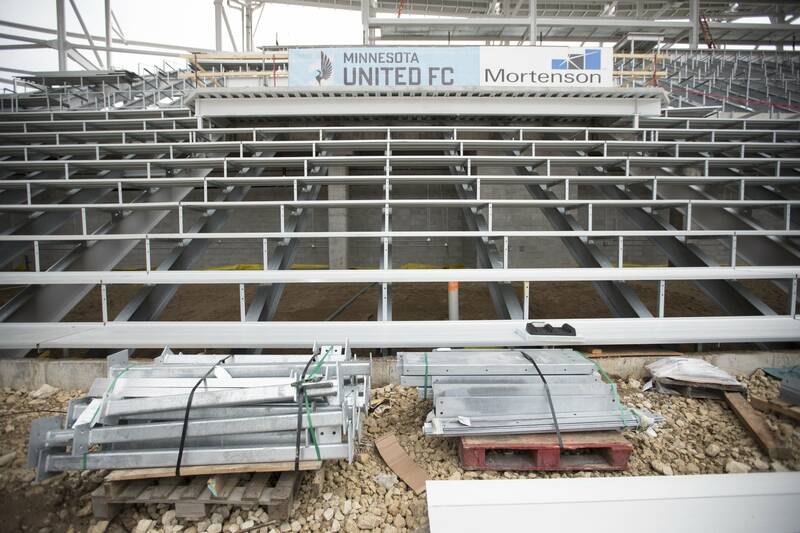 Minnesota United FC owner Bill McGuire says the transformation has been remarkable to watch. "I've been fascinated through the winter watching the steelworkers. These guys are fabulous. Look at what they've done and how it's come together," McGuire said. "Remember, the first piece of steel went in last November." The date of the first game in the new stadium is up to Major League Soccer, but McGuire expects it will be sometime in early April of 2019. 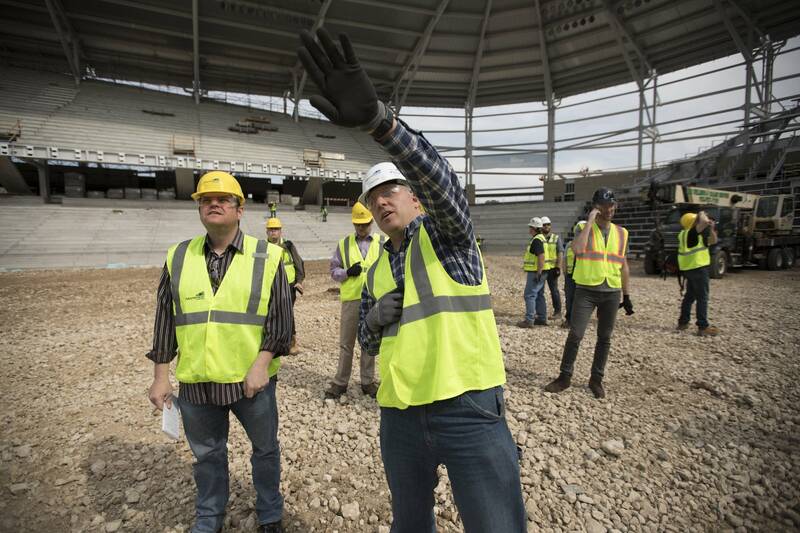 Huber said the pitch, as the playing field is called, is scheduled to be installed in October, when the first rolls of sod are delivered from Colorado. As at Target Field and TCF Bank Stadium, there'll be a glycol heating system underneath. And to ensure that the grass stays green, a robotic grow light will roam the field on days the sun doesn't shine. 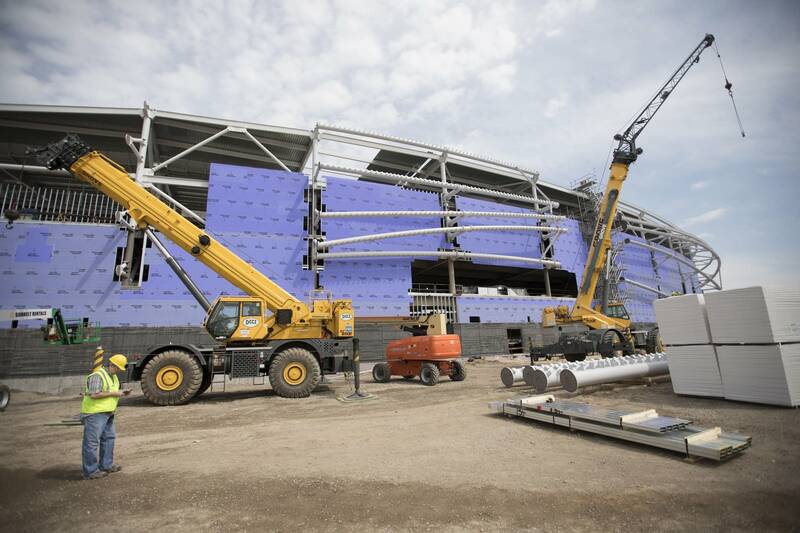 Correction (May 4, 2018): Allianz Field was misppelled in some photo captions in an earlier version of this story.